Origin and distribution: The Dorper, locally called Dorsian, is a composite breed of South Africa developed at Grootfontein in 1940-50 by the Department of Agriculture and some farmers to produce maximum number of lambs with good mutton qualities, which could be marketed off arid and extensive grazing conditions. 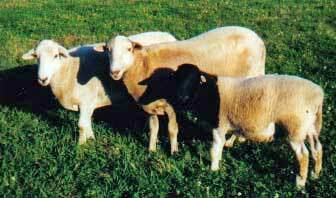 It was developed through the crossing of the Blackhead Persian ewes with the Dorset Horn rams. A fixed type was developed through inter-se mating. A breed society was established in 1950 in the Republic of South Africa. The Dorsian (White variety) was affiliated to Dorper in 1964 (Wilson 1991). The Dorper sheep thrive in arid to semi-tropical climate and are suitable for areas with rainfall of only 100 to 760 mm. Although this breed was developed originally for the more arid areas of the South Africa, today they are widely spread throughout the country. The breed has performed well in Namibia and has been exported to many countries throughout the world including Zimbabwe, Zambia, Kenya, Mauritius, Malawi, Burundi, Israel, Saudi Arabia, and Australia (Campbell 2000; de Waal and Combrinck 2000; Milne 2000). Physical characteristics: The typical breed standard involves a short loose light covering of hair and wool (wool predominating on the forequarter) with a natural clean kemp underline. The breed is barrel-shaped, hornless with short, dull black or white hair on the head, often with black feet; they have short hair and coarse wool; the black headed ones are called `Dorper' and the white headed ones `White Dorper'. Peculiarity: The peculiar features for the Dorper is that they were developed for arid to semi-arid environments, but are well adapted to, and perform favourably under a variety of climatic and grazing conditions, including intensive feeding systems (Brand 1992; Schoeman 2000). They are non-selective grazers and fit well in veld management system where they can be used to convert feed resources, which are not utilised or underutilised by other livestock. They have a high lambing percentage reaching up to 180% and can produce 2.25 lambs on an annual basis (Campbel 2000; Schoeman and Burger 1992). Their inherent growth potential is such that they can attain live weight of 36 kg at 3-4 months of age. They have also a very even temperament (Cloete et al. 2000). Breed status: Due to its productivity, hardiness, and other important positive merits, the Dorper became the second most numerous sheep breed in South Africa and accounts for 65% of the commercial flock in Namibia (DAGRIS 2005). The success of the Dorper in Western Australia has been due to production of first cross lambs that have been highly sought by the live sheep exporters to the Middle East. The estimated population in 1992 was greater than 7 million in South Africa (DAD-IS 2005). The population trend is increasing and there are 700 stud breeders in South Africa [CS 1.14 by Olivier]; [CS 1.26 by Ramsey et al.]. Utility: The breed is not only ideally suited to the purpose for which it was bred, but is adaptable to a variety of conditions throughout the world and makes a huge contribution to mutton production worldwide. It has a long breeding season which is not seasonally limited so that lambs can be dropped at any time of the year. Lambing intervals is about eight months. The average litter size is 1.19 to 1.5. A lambing percentage of 150% can be reached under good conditions while, in exceptional cases, 180% can be attained. Thus on average a Dorper ewe can produce 2.25 lambs on an annual basis (DAD-IS 2005). Average birth weight was 3.48 kg for males and 3.37 kg for females (DAGRIS 2005). Adult live-weight was 74 kg for males and 44 for females (DAD-IS 2005). The Dorper lamb can reach a live-weight of about 36 kg at the age of 3-4 months. The daily gain averages at 243 g. This ensures a high quality carcass of approximately 16 kg and is associated with the inherent growth potential of the Dorper lamb and its ability to graze at an early age. In more marginal areas of Kenya's Machakos District, a study involving 15-years of production data (King'oku et al. 1975) showed that Dorper ewes registered 10% twining rate, 78% lambing (fertility) rate, average birth weight of 3.6kg, pre-weaning lamb growth and mortality rates of 178g/day and 14%, respectively. While an earlier study in Naivasha's Ol'magogo estate study in Kenya, showed higher pre-weaning daily gains (183g/day) and lower lamb mortality rates (3.5%) and average weaning weights of 23.8kg at 109 days (De Haas et al. 1973). The Dorper are not susceptible to fly strike and fleece rot. They have a high degree of disease resistance. Dorper ewes produce a large quantity of milk, are instinctively fond of their lambs and therefore care for, and rear, their offsprings well. A well-grown Dorper lamb has carcass qualities with respect to conformation and fat distribution, which generally qualifies for a super grading. Dressing percentages can reach 54%. In South Africa, Dorper hides are sold as top quality leather under the name `Cape glovers' and represents 20% of the total carcass value (DAD-IS 2005). Recent studies made in Kenya on genetic resistance, by Baker et al. (1999; 2002) revealed that the Dorper sheep were susceptible to gastro-intestinal nematodes (Haemonchus contortus) and had higher mortality from birth to yearling compared to Red Maasai and their crosses. Baker R.L. Mwamachi D.M. Audho J.O. Aduda E.O. and Thorpe W. 1999. Genetic resistance to gastro-intestinal nematode parasites in Red Maasai, Dorper and Red Maasai X Dorper ewes in the sub-humid tropics. Animal Science (UK). 69(2), 335-344. Baker R.L. Mugambi J.M. Audho J.O. Carles A.B. and Thorpe W. 2002. Comparision of Red Maasai and Dorper sheep for resistance to gastro-intestinal nematode parasites, productivity and efficiency in a humid and a semi-arid environment in Kenya. Proceedings of the 7th World Congress on Genetics Applied to Livestock Production, 18-23 August, Montpellier, France. Brand T.S. 2000. Grazing behaviour and diet selection by Dorper sheep. Small Ruminant Research.36(2):147-158. Campbell Q.P. 2000. Make money with Mutton sheep. Cloete S.W.P. Snyman M.A. and Herselman M.J. 2000. Productive performance of Dorper sheep. Small Ruminant Research. 36(2):119-136.
de Haas H.J. Chemitei V.C and G.P. Smith. 1973. Three years experience with Dorper sheep a the National animal Husbandry Research Station, Naivasha. Sheep and Goat Development Project, Ministry of Agriculture, Kenya. Working Paper No. 4. pp.5. de Waal H.O. and Combrinck W.J. 2000. The development of the Dorper, its nutrition and a perspective of the grazing ruminant on veld. Small Ruminant Research. 36(2):103-118. Fourie L.J. and Horak I.G. 2000. Status of Dorper sheep as hosts of ectoparasites. Small Ruminant Research. 36(2), 159-164. King'oku J.M. J. N'Thome E.M. Ogutu and C. Rakozi. 1975. Fifteen years production data on Dorper sheep at Katumani research Station, Machakos, Kenya. Sheep and Goat Development Project, Ministry of Agriculture, Kenya. Technical Note No. 12. pp.12. Milne C., 2000. The history of the Dorper sheep. Small Ruminant Research. 36(2):99-102. Schoeman S.J. and Burger R. 1992. Performance of Dorper sheep under an accelerated lambing system. Small Ruminant Research. 9:265-281. Schoeman S.J. 2000. A comparative assessment of Dorper sheep in different production environments and systems. Small Ruminant Research. 36(2):137-146. Buvanendran V. Makuzaa S.M. and Chironga P. 1992. Phenotypic and genetic parameters of weaning traits in Dorper sheep in Zimbabwe. Small Ruminant Research. 7(4):369-374. Chemitei V.C.C. 1978. The sheep and goat production at various Research Stations in Kenya. Sheep and Goat Development Project, Ministry of Agriculture, Kenya. Technical Note No. 21. pp. 16.